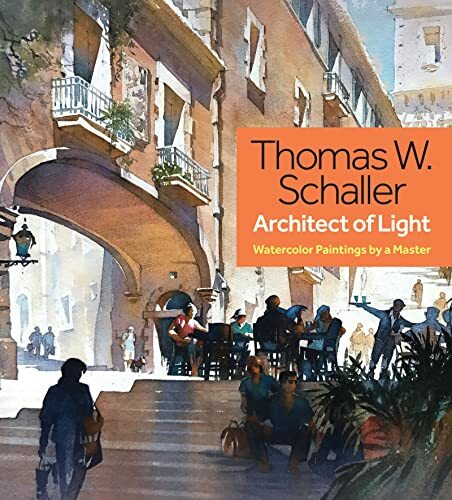 Thomas Schaller has been an architect and architectural illustrator for 30 years before he switched to become a fine artist. His career is now at a stage where people refer to him as a master, or as the title of the book suggest, an "architect of light". This large 208-page hardcover featured 150 pieces of his very best paintings. I love his style, the way he uses colours, how the treats the hard and soft edges and of course how he captures the light, or as he puts it "paint the shades and the shadows that allow the light to shine". The paintings are wonderful. There's confidence in the looseness and suggested details. The subject matter is a mix of urban scenes, landscapes and people. All the artworks are captioned so you can read the short stories. Other than the paintings, the other highlight of the book are the lengthy inspiring and insightful essays that talk about the creative process of painting. Thomas Schaller talks about his approach, the importance of technique vs storytelling, and also what he has learned from years of painting as well as from other artists. This is a wonderful book. The paintings are huge and nicely reproduced. The writing is an informative read. Highly recommended. It's well worth the money. If you like this book, check out Michael Readon's Watercolor Techniques: Painting Light and Color in Landscapes and Cityscapes too. Wow. That's not a word I use often. A beautiful book. Something for my wishlist, definitely. This book wouldn't be out of place simply as a "coffee table" book, to be enjoyed by all, regardless of their interest in watercolour.